Are you planning a vacation to Walt Disney World? Courtesy of our guest blogger Steve Bell from Military Disney Tips. 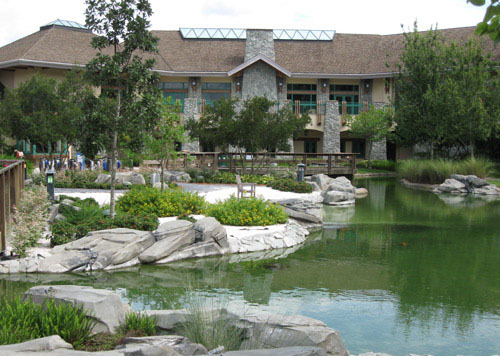 Shades of Green – A place for military members to stay at the Happiest Place on Earth. Shades of Green is an Armed Forces Recreation Center, which is located at Walt Disney World in Orlando Florida. Military families can stay right on Disney property in deluxe rooms at substantially less than they’d pay at comparable Disney resorts nearby. Shades of Green offers large beautiful rooms, all the recreation options you’d find at a deluxe resort, and discounted theme park tickets for all the Orlando area attractions. My family and I first stayed there in 2000 for a week-long Disney World vacation. The great rates at Shades of Green, which are based on rank, were what allowed us to afford such a long trip. In 1992, after Desert Storm Army MWR was looking for a new Armed Forces Recreation Center and surveys indicated Orlando was where military members wanted one. MWR placed an ad in the Orlando Sentinel inquiring if anyone in the local business community would be interested in leasing a resort property to the Army. The number of rooms and required amenities, such as a pool, restaurant and lounge were listed. They received 40 responses! It was decided that the offer from the Walt Disney World Company to lease the Disney Inn golf resort was the perfect offer. Shades of Green opened its doors on 1 February 1994. At the time all branches of the military wore some form of green utility/battle uniform, so it was decided to call the resort the Shades of Green to reflect the different shades of green the different services wore. Shades of Green has 586 of the largest guest resort rooms on Walt Disney World property. The rooms all have two queen beds and a small sofa sleeper, so they’ll easily sleep a family of five. Shades also has eleven family suites. Room rates at Shades of Green are based upon the military member’s rank, this allows junior members of the military to be able to afford a stay at the resort. There are three price categories for: E-1 thru E-5 and Cadets; E-6 thru E-9, O-1 thru O-3, WO-1 to CW-3, Widows, Medal of Honor Recipients, 100% Disabled Veterans; and O-4 thru O-10, CW-4, CW-5, Active and Retired DoD Civilians. Shades of Green has two lovely heated pools. A quiet pool off by itself and a family oriented pool in the shape of Mickey Mouse’s head and ears, co-located with a sports bar and grill and kiddy pool. Shades sits between two Disney golf courses, has tennis courts, and video arcades and console games for the kids. If you want to pamper your body, first hit the gym and then relax in the full service Magnolia Spa, a full service spa and salon. Shades of Green has many dining options, from full service dining to grab and go locations for a quick breakfast on the way to the theme parks. Mangino’s – An Italian Bistro. Serves a variety of traditional Tuscan dishes plus they have nightly specials and a very large wine list. Mangino’s is my family’s favorite at Shades. Garden Gallery – Serves buffet meals. All you can eat breakfast and American fare dinner buffets are served every day. Evergreens – A Sports Bar and Grill. Serves sandwiches, wraps, burgers, salads, and wings. Java Café – Starbucks coffee and pastries! Express Café – features breakfast sandwiches, pastries, snacks, fresh coffee, tea and more. For lunch various sandwiches are available. On the Greens Grill – Located on the golf course near the Magnolia Pool. Serves quick and delicious grilled hot dogs, Italian sausage, hamburgers, sandwiches, quick snacks and cold drinks. Shades of Green offers military discounted Disney theme park tickets in its Attractions Ticket Sales Office for all the Disney World attractions: Theme Parks, Water Parks, and Disney Quest. They also sell discounted annual passes and Florida resident tickets. You can purchase Disney’s popular Armed Forces Salute tickets here too. They also carry military discount tickets for Universal Studios Orlando, Seaworld, and many other Orlando area attractions and dinner shows. Shades of Green offers its own free bus transportation system to various locations on Disney World property. Shades Guests are also able to use Disney World’s own transportation system for free. There is a shuttle bus, which will take you to Universal or Seaworld for a fee. Rental cars and ECVs/Scooters are available on property. If you are flying into town you will have to arrange your own ride to and from the airport. Over the last few years Shades of Green has offered both discounts of their regular room rates and package deals, which include meals. These are very popular! The resort often fills up to capacity very early, especially for peak seasons (summer, spring break, Christmas). Reservations are accepted one year in advance, so be sure to book early. Shades, while not a Disney hotel affords some of the same benefits that guests staying at Disney resorts receive such as Disney’s Extra Magic Hour (early entry and late stays in the parks) and package delivery to your room. If you are looking for a great place to unwind from the busy life of a military family, I highly recommend Shades of Green. It’s a fantastic destination for a post deployment welcome home trip! Please check out my site for more information about Shades of Green and many other ways to save on your Disney vacation. For more vacation resources and Steve’s blog on all the AFRCs please see MilitaryOneClick’s Travel Page and Steve’s AFRCs Blog. My husband is in the military but we are staying at another Disney resort. Can we sill take the shuttle to universal and sea world? That is a great question. I will get an answer for you. Any military member can use the shuttle service at Shades. You’ll need to set it up 24 hours in advance through the Shades of Green Attractions Sales Office. The price is $10 for Adult and $5 for kids (under 4 is free). Depending on the party size you could get into a situation where a taking is cheaper. A taxi is cheaper than the free transportation from shades? Or we can’t use it because we aren’t staying there? Pretty nice post. I simply stumbled upon your blog and wished to mention that I’ve truly enjoyed surfing around your blog posts. In any case I’ll be subscribing on your rss feed and I hope you write again very soon! Always awesome to find a new web site this good! I will be back for certain. Please reach out to Steve. He will have the exact answer you need. I don’t want to give you bad gouge. I am not exactly sure. Please see Hale Koa’s website, http://www.halekoa.com/accommodations/accommodations/eligibility.html. If you don’t find your answer here, please give them a call. I’m Sorry You Are NOT a Military Family–So Put That In Your Pipe And Smoke It. How can you decorate pumpkins on a dime?